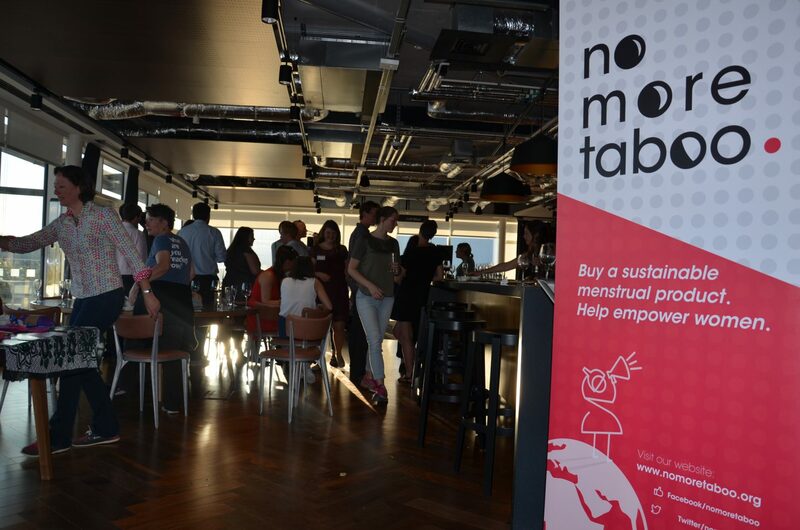 Read how Chloe Tingle went from a career in engineering to launching No More Taboo, a not-for-profit organisation that seeks to eliminate the global taboo around menstruation, help fight period poverty in the UK and reduce our impact on the environment. And she’s only 25! Here’s her inspirational story. Many people wonder how I went from being an engineer to running a women’s health not-for-profit, No More Taboo but for me engineering is all about problem solving and that’s what I’m doing. I studied for a Masters in Engineering Design at the University of Bristol. Being one of only a hand-full of females on the course, I’d always felt a bit ‘different’ and that I had to fight a little bit harder for my right to be recognised in the field as an equal. As I went through University, I became more and more interested in sustainability and the environment. I managed to land myself a year working for a wind turbine manufacturer. I was so excited to be working for a big company in the green energy sector and I really thought this would be the life for me. What I realised throughout the year, was that although I loved the company I worked for, I enjoyed my roll and I was bringing new ideas to the team, I didn’t feel very fulfilled and there were still so many things that bugged me about working for a big corporation. Everything revolved around money, there were major redundancies whilst I was there and there was still so much waste in terms of efficiency and materials, there were so many things I wanted to change but would never have the power to do anything about. I realised, that actually what I enjoyed the most was all the volunteering I was doing for small charities and international organisations, this work was having a much clearer impact on people’s lives. I spent time working with Bristol based charities and social enterprises like FRANK Water. I knew working in the third sector wouldn’t be easy but tying in my love of travel, I spent time getting as much experience as possible working in developing communities. I realised that my main passion was people, I often joke that I’m much more a ‘People’ engineer than a ‘Technical’ engineer. All my friends were off getting graduate engineering jobs at £40k pa and I was scrabbling around doing bits of temping to try to get the cash together to go and do another trip volunteering, but I realised if I had the luxury of a regular income I would never go back to living on a shoe-string budget so it was now or never. Where did the idea for No More Taboo come from? “Aunt Flo is in town.” “The painters and decorators are in.” “It’s my time of the month.” We have all grown up with a huge choice of euphemisms when referring to the most obvious event in our menstrual cycles (according to a recent study, over 5000 euphemisms exist). But why can’t we just say “I have my period”? Periods are a normal, healthy part of people’s lives. As I was growing up periods presented a relatively minor inconvenience to me, I just “got on with it”. At 18, I bought my first menstrual cup, excited at the prospect at not having to fill my backpack with hundreds of tampons as I headed out to explore more of the world and didn’t think much more of it. It turned out that they knew that menstrual health and hygiene was a huge issue in their community but they weren’t sure what to do about it. I was shocked by how little knowledge the teenage girls I was working with had about periods, combined with poor hygiene facilities and limited access to sanitary products. Despite these setbacks, the Bolivian people had such concern for Pacha Mama, or Mother Earth, and were appalled by the damage disposable products can have on the environment. I was already concerned about our own disposable culture, meaning thousands of tonnes of contaminated menstrual waste are dumped into landfill or burned each year, all over the world. So it made me think, why aren’t we doing more here? As I have learned more about different taboos and restrictions around the world including in Nepal and Uganda, I’ve realised what a problem not having the resources or knowledge to manage your period can cause and the impact this can have on your life. As an engineer, my passion is problem-solving. This is a problem that absolutely fascinates me, with links to feminism, equality but also basic human rights, fighting poverty, access to water and sanitation, education and choice. How did you move from idea to actual venture? My initial idea was very simple. I would sell reusable sanitary products online and use the profits to support projects in developing countries, like the one I had been doing in Bolivia. I had three months between coming home from volunteering in Bolivia and going out to start a new job for six months in Uganda. Giving myself a three month time frame, to set up a company and have a launch was exactly the sort of motivation I needed. In fact, I decided to launch at a public event on International Women’s day meaning there was no wiggle room or pushing the deadline back. The aim was to be “functional, not embarrassing” as Bryony Thomas from Watertight Marketing one of my mentors would say. I got myself a graphic design student volunteer, I blagged some free legal advice on how to start-up a social enterprise and I got to work. I was amazed at how easy it was, loads of people say to me, “It’s so impressive you started your own company at the age of 23” but I always say if you’ve got £40 to register at companies house, you too can be a CEO. That’s not the hard bit, the hard bit is everything that comes after that. It’s taken me two years since then to work out exactly what we do and how we do it and I’m definitely still learning. We’ve realised that we are about much more than promoting reusable sanitary products, in fact our original business model of selling menstrual cups and washable pads to make money for projects overseas was never going to work. For one thing, menstrual cups last for 10 years and only cost £20, so you’re not going to get many repeat customers or make a lot of money. For another, they are still perceived as either ‘disgusting’ or only for the eco-warrior. What we offer is information, support and guidance to let people know there is a choice that exists that these products are actually really practical, have loads of other bonuses (like being able to use them for up to 12 hours with no risk of toxic shock syndrome) and that creating no waste is just one element of what they are about. But reusable products is now just one part of what we do; we bring women and anyone who menstruates together to talk about issues which we don’t usually talk about! 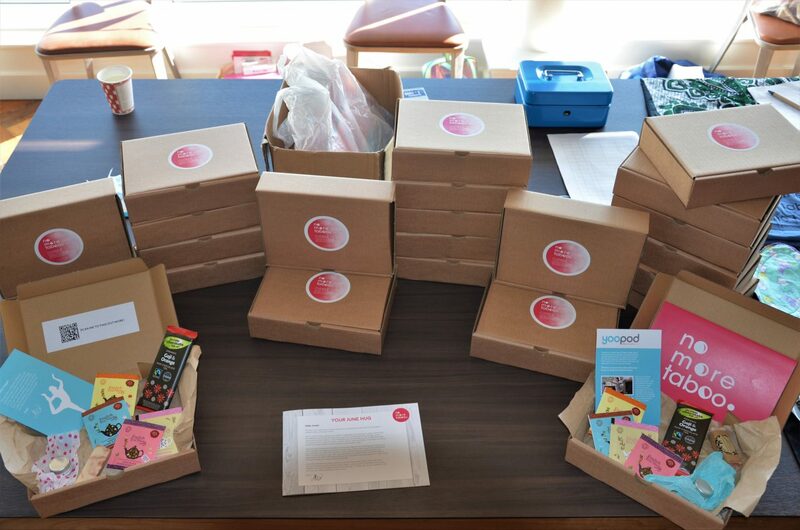 We host events and we make people feel a bit more appreciated on their period. We also teach people about period poverty, something that is happening not just in developing communities but right here on our doorsteps in Bristol. Women and girls are unable to afford sanitary products, they are embarrassed and disempowered on their period and we’re out to change that. We run educational workshops in schools, as well as training for people living in poverty and the organisations that they access such as foodbanks, drug support groups and refugee centres. Monthly Hugs our flagship product which was recently launched brings so many of these elements together. We are a not-for-profit social enterprise striving for a period friendly world for everyone, this is not just about changing things for people who live in poverty it’s about changing the way periods are talked about, managed and understood for the whole of society. We all have more to learn about this natural function that 50% of the population do at some point in their lives. Monthly Hugs is for women who are passionate about making a change, that are interested in ethical consumerism and trying new products from small and medium UK businesses to help them with their own well-being whilst supporting someone else to have a better period too. Our target audience is professional women, who perhaps have the financial resources but not the time to look after themselves on their period each month. 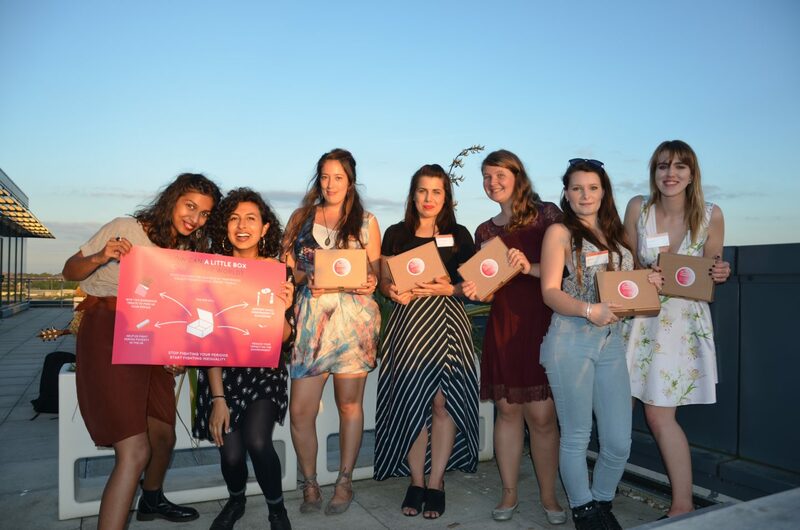 For us the best endorsement is through word of mouth and testimonials, people who come to our events often tell their friends about us and part of the reason for launching the subscription box, Monthly Hugs, is as a conversation piece to get people talking about a topic they would usually avoid and break down those taboos about periods. We have grown very organically and we love to see our No More Taboo family grow more and more. Our recent crowdfunder has enabled us to reach out to so many new people and get them on board. The biggest obstacle I’ve had to face is starting this enterprise with absolutely no capital and no way of paying either myself or any other staff members. I’ve often been told that female entrepreneurs are very risk averse and for me that has meant I haven’t wanted to take on any loans. I have been entirely dependent on my partner financially which has put a lot of pressure on us. I’m still very penny-pinching with the enterprise but have started to put a proper value on our time and saying no to work that won’t support us in covering our overheads. Working in the third sector, its often tricky to say no to doing work for free but we are finally feeling confident enough to do that. 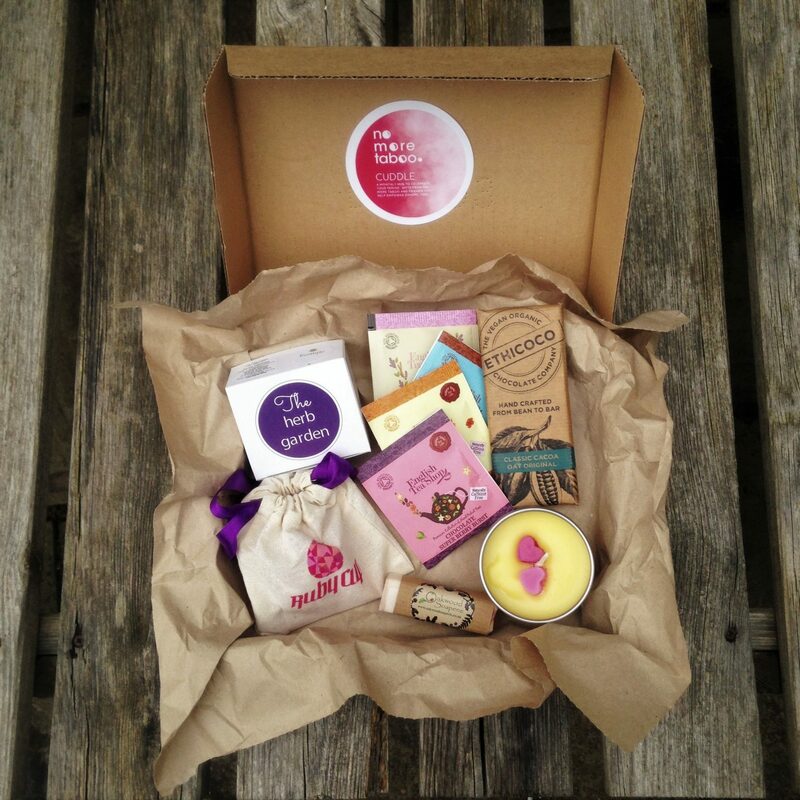 My proudest moment was actually really recently, we had a launch event in Bristol for our brand new subscription box Monthly Hugs. As we had just met our crowdfunding target the day before, this was a real celebration and an accumulation of two and a half years hard work. I was so proud to see the team I’d built around me, the supporters who had helped me get to where I am as well as friends and family all in one place and to see that No More Taboo had actually grown to be so much more than what I had first imagined. It was a real milestone for me and a very proud moment. My work is so important to me because I’m driven to problem solve, you’ve just got to keep chipping away at something and you can only do that if it’s something you really believe in and that keeps you up at night. I think I’ve realised I can’t easily work for anyone else because once I get an idea in my head I’m like a dog with a bone. The people who inspire me the most are people who come up with incredibly simple solutions for things that are problems for so many people. For example, I met a man in Guatemala who invented a ‘Bicimaquina’, a pedal powered grinder that could grind husks in a few minutes, a job which used to take the women farmers hours to do. I met a monk in India who was powering an entire school through electricity he was generating from a home-made bio-digester which used every scrap of waste the school created, and was used as part of interactive lessons for the students on how to conduct maintenance and understand electricity. One of the most inspiring men I’ve met was the headteacher of one of the schools I worked with in Bolivia who was so passionate about menstrual health. He had started a social enterprise making and selling soap so that every student could take soap home to their parents but also learn about economics and marketing whilst running their own stall at the market. I love to learn and take every opportunity that I can to do so, I’m inspired every day by the people I meet in my life running No More Taboo from my advisors and mentors to the student volunteers who come to me full of new ideas. How do you balance No More Taboo with your family? At 25, I am still very early into my career. I haven’t yet started a family, although I do count my dog, Kibibi, as my baby, having brought her home with me from Uganda she is one doted on ‘fur-baby’. However, family and friend time is very important to me. My family and my partner have endless patience, supporting me both financially and mentally, there is no way I could have gone on this crazy journey without them. I try hard to carve out weekends and to stop working in the evenings (although its not always easy). I recently moved out of the city to Devon to be near the beach and this has been the best thing for my work-life balance. It’s very easy to say no to a networking event when you’re a hundred miles away contemplating which beach to watch the sunset on that evening instead – I would thoroughly recommend to anyone! Just go for it, don’t let people’s perceptions or worries get you down. If you really believe in something you can make it happen. There will be blood, sweat and tears, starting your own organisation can really take its toll on you but it will all be worth it in the end, just keep persisting. On those days when you’re feeling down or overwhelmed you can always rely on your family/friends/team to pick you up and remind you, actually, you have achieved a lot and you can’t do everything all at once. It’s important to celebrate what you have done, both big and small! 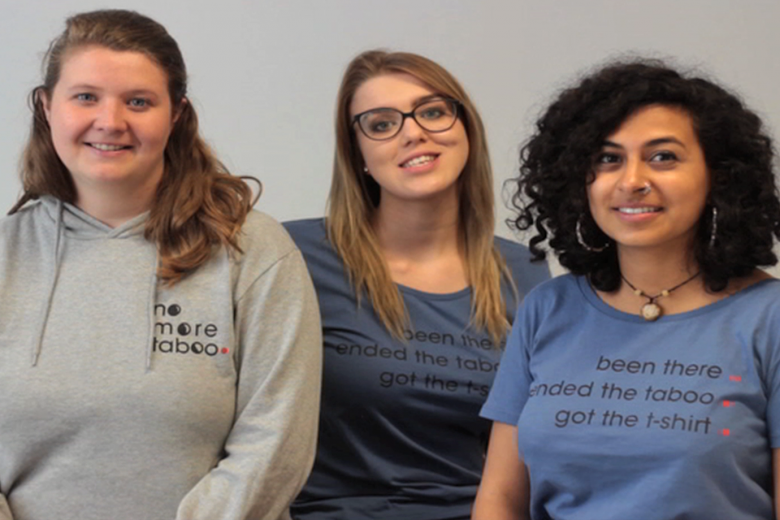 You can find out more about No More Taboo on their website.